Any time during regular Studio hours!! 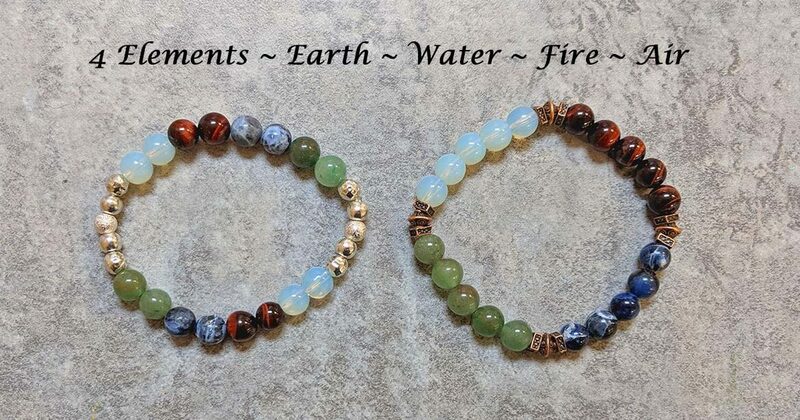 In this make and take you will create a bracelet using 4 different stones to represent the 4 elements. The World can be broken down to 4 basic elements – Fire, Water, Air, and Earth. They are considered the energy forces that sustain life. Air represents intellect, mental intention, and connection to universal life force. Earth energy represents grounding, substance, and family roots. Fire represents energy, transformation and inner strength. While water represents emotional release, intuition, and inner reflection. When they are harmonized, it is a symbol of balance and new life. You will also receive a pamphlet to take home to remind you which stones are which elements as well as more detailed information about each of the elements!